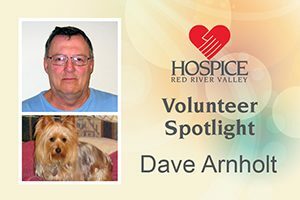 I chose to be involved with Hospice because my family has used Hospice services twice now. My father was under Hospice care, as was my step-father. It made a tremendous difference for both of them and, in particular, for my mom. My favorite memory is watching my dog, Mitzy, work a crowd of people. She is a master at that art. Mitzy knows how to work so she is next to the patient but in a way that the attention is given to both of them. Most of the elderly people have a fairly good knowledge of dogs, so discussions cango that way. Mitzy is an Australian Breed “Australian Silky Terrier,” or Silky for short. I can go into what the breed does as compared to a Corgi or Sheltie, which are herding dogs. If you were stranded on an island, which one item would you take with you and why? If I was stranded on an island, it would be the result of a colossal goof up. I’ve been on many islands as an adult — thank you, U.S. Air Force — so I know surviving could be tricky. I did think I’d like my dog, but then I’d have to share my food, and who wants to argue with a dog over who gets a couple of minnows and then have the dog say, “Couldn’t you do better?” So the item I’d like to have is a fully supplied solar powered amateur radio station. With that I can talk to people and find out through triangulation where the devil I’m at and how can I get off this shelf of sand and rock and get back home.